An Act to amend the Canadian Human Rights Act and the Criminal Code (Bill C-16, 2016) is a law passed by the Parliament of Canada. The law adds gender expression and gender identity as protected grounds to the Canadian Human Rights Act, and also to the Criminal Code provisions dealing with hate propaganda, incitement to genocide, and aggravating factors in sentencing. The bill was introduced by Justin Trudeau's Liberal government on May 17, 2016. It passed in the House of Commons by 248-40 votes and in the Senate by 67-11 votes with three abstentions. The bill became law upon receiving Royal Assent on June 19, 2017, coming into force immediately. The bill is intended to protect individuals from discrimination within the sphere of federal jurisdiction and from being the targets of hate propaganda, as a consequence of their gender identity or their gender expression. The bill adds "gender identity or expression" to the list of prohibited grounds of discrimination in the Canadian Human Rights Act and the list of characteristics of identifiable groups protected from hate propaganda in the Criminal Code. It also adds that evidence that an offence was motivated by bias, prejudice or hate based on a person's gender identity or expression constitutes an aggravating circumstance for a court to consider when imposing a criminal sentence. The law amends the Canadian Human Rights Act by adding "gender identity or expression" as a prohibited ground of discrimination. That makes it illegal to deny services, employment, accommodation and similar benefits to individuals based on their gender identity or gender expression to matters within federal jurisdiction, such as the federal government, federal services to the public, or a federally regulated industry. A person who denies benefits because of the gender identity or gender expression of another person could be liable to provide monetary reimbursement. The law amends the Criminal Code by adding "gender identity or expression" to the definition of "identifiable group" in section 318 of the Code. Section 318 makes it a criminal offence to advocate or promote genocide against members of an identifiable group, which now includes gender identity or gender expression. Since the definition of "identifiable group" is also used in section 319 of the Code, the amendment also makes it a criminal offence to incite or promote hatred because of gender identity or gender expression. The law also adds "gender identity or expression" to section 718.2 of the Criminal Code. This section is part of the sentencing provisions and makes gender identity and gender expression an aggravating factor in sentencing, leading to increased sentences for individuals who commit crimes motivated by bias, prejudice or hate based on gender identity or expression. The law is the most recent iteration of several proposed bills introduced to previous parliaments. In 2005, New Democratic Party MP Bill Siksay introduced a bill in the House of Commons to explicitly add "gender identity or expression" as prohibited grounds of discrimination in the Canadian Human Rights Act. He reintroduced the bill in 2006. In May 2009, he introduced it again, with additional provisions to add gender identity and gender expression to the hate crimes provisions of the Criminal Code. In February 2011, it passed third reading in the House of Commons with support from all parties but was not considered in the Senate before Parliament was dissolved for the 41st Canadian federal election. Two bills, C-276 and C-279, on the subject were introduced in the 41st Canadian Parliament by both the Liberals and the NDP, respectively. The NDP's Bill C-279 passed second reading on June 6, 2012. However, that bill also died on the Senate order paper when the 2015 federal election was called. The Canadian Bar Association supported the passage of the bill, by writing a detailed letter to the Chair of the Standing Senate Committee on Legal and Constitutional Affairs. Speaking for the CBA, the President, René J. Basque, Q.C./c.r, argued that the bill would provide necessary protections for transgender people; made explicit the protections for transgender people which were already contained in the prohibition on discrimination based on sexual orientation; and did not pose any risk to freedom of expression. Following the introduction of the bill in the House of Commons, but before introduction in the Senate an opinion poll on C-16 conducted by the Angus Reid Institute found that 84% of Canadians said they support adding "gender identity as a prohibited ground for discrimination under the Canadian Human Rights Act" while 18% opposed. Jordan Peterson, a professor of psychology at the University of Toronto, criticized the bill, saying that it would require him to use preferred pronouns of transgender people and make not doing so hate speech. According to legal experts, not using preferred pronouns would not meet legal standards for hate speech. In November 2017, Lindsay Shepherd, a teaching assistant at Wilfrid Laurier University who showed a video of Peterson's critique of Bill C-16 in her "Canadian Communication in Context" class, was reprimanded by faculty members, who said that she may have violated Bill C-16 by showing the video and holding a debate. Commenting on the incident, University of Toronto law professor Brenda Cossman noted that the Canadian Human Rights Act (which C-16 amended) does not apply to universities, and that it would be unlikely for a court to find that the teaching assistant's actions were discriminatory under the comparable portions of the Ontario Human Rights Code. ^ Kassam, Ashifa (2016-05-17). "Canada to introduce new laws against transgender discrimination". the Guardian. Retrieved 2018-03-17. 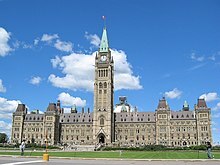 ^ a b "House of Commons - Recorded Votes: House Government Bill C-16". parl.ca. Parliament of Canada. Retrieved 10 February 2019. ^ Senate of Canada - Vote Details: An Act to amend the Canadian Human Rights Act and the Criminal Code – C-16 – Third Reading, June 15, 2017. ^ House of Commons - House Government Bill - C-16: Coming into Force. ^ Tasker, John Paul (June 16, 2017). "Canada enacts protections for transgender community". CBC News. Retrieved June 16, 2017. ^ An Act to amend the Canadian Human Rights Act and the Criminal Code, S.C. 2017, c. 13, s. 2. ^ Canadian Human Rights Act, R.S.C. 1985, c. H-6, s. 2. ^ An Act to amend the Canadian Human Rights Act and the Criminal Code, S.C. 2017, c. 13, s. 3. ^ Criminal Code, R.S.C. 1985, c. C-46, s. 318. ^ Criminal Code, R.S.C. 1985, c. C-46, s. 319. ^ Criminal Code, R.S.C. 1985, c. C-46, s. 718.2(a)(i). ^ "Letter from René J. Basque, QC/cr, President of the Canadian Bar Association, to The Honourable Bob Runciman, Chair of the Standing Senate Committee on Legal and Constitutional Affairs, May 10, 2017". ^ Angus Reid Institute, "Transgender in Canada: Canadians say accept, accommodate, and move on", September 7, 2016. ^ Maloney, Ryan. "Liberals' Transgender Rights Bill Backed By Majority Of Canadians: Angus Reid Institute Poll". Huffington Post. Retrieved 10 February 2019. ^ Khandekar, Tamara (24 October 2016). "No, the Trans Rights Bill Doesn't Criminalize Free Speech". Vice. Retrieved 1 October 2018. ^ Murphy, Jessica (4 November 2016). "The professor versus gender-neutral pronouns". BBC News. Retrieved 1 October 2018. ^ Hopper, Tristin (November 20, 2017). "Here's the full recording of Wilfrid Laurier reprimanding Lindsay Shepherd for showing a Jordan Peterson video". National Post. Retrieved November 28, 2017.